Mechanical Filtration acts as a barrier, trapping dirt and debris (usually in an easily-cleaned foam block) so that it can be removed. It is the first defence for clean, clear water. Biological filtration is performed by beneficial bacteria which grow naturally in the filter media. These microscopic organisms convert the harmful toxins (ammonia and nitrite) which are manufactured by fish and decay processes into much safer nitrates, which are an excellent plant food. In the process the water is made clean. The proper balance of bacteria against waste is the most important part of keeping a pond in healthy condition for fish and plants. Too little bacteria or too much waste will turn everything to muck. Each time you add fish (or as your fish get larger) you will need more bacteria to "digest" the waste produced. Waste is also produced if you let debris lie on the bottom of the pool where it decays. Bacteria grows and multiplies naturally as it is fed (up to the limit that the filter media is capable of supporting). Think of your media chamber as an apartment building. Bacteria will multiply until all of the available apartments are full or until the food supply runs out. If your need for waste digestion outstrips the media capacity (available apartments), you must either add another chamber for media or add another filter. There are three types of useful pond filters. 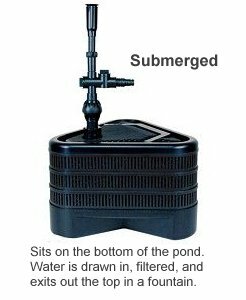 Submersed Pond Filters are easy to hide, although they take up valuable space inside the pond. They are usually attached to the intake side of the hose to trap particulates before they reach the pump, thus protecting the pump as well as filtering the water. 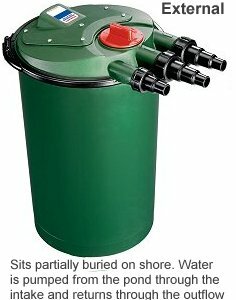 They come in different sizes and are usually fairly easy to clean although the pond keeper will have to wade into the pond or in some other way retrieve the filter for cleaning, and waste may spill back into the pond if not handled correctly. In-line Pond Filters are usually self-contained canisters which are sealed and operated under pressure. They can be used submerged or above ground. External Pond Filters are the largest and best filters. They are located above ground (or partially buried) somewhere near the pond. Water enters the filter from the pump and trickles through several types of media to clean and de-toxify the water. Although they need the least cleaning and provide the most ease of cleaning, the pump is not protected from floating debris because the pump is placed before the filter. To protect the pump, it is best to attach a submerged pre-filter on the intake side of the pump and an external filter on the output side. There are new filters on the market now that are "self-cleaning". They have pressure chambers that can be squeezed out by turning a knob on the filter to compress the water out of the media and flush the debris out the line. They are a great advance in pond-keeping. 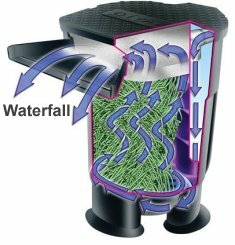 Waterfall Pond Filters There are now some very nifty waterfall filters that can be added to your system, creating not only a beautiful waterfall, but enhancing the biological filtration in your pond as well. While we don't recommend them as the only source of filtration in most cases, they can be a very beneficial addition to the filtering process. A waterfall or fountain quickly becomes the focal point in your water garden. Additionally, moving water discourages mosquitoes, which prefer to breed in stagnant pools. A misunderstood part of your pond ecosystem. Many people shy away from rocks and gravel on the bottom of their pond for fear of a maintenance problem. The visual appeal of your pond is greatly enhanced by a more natural-looking bottom. Additionally, gravel and rocks add more biological filtering activity because the beneficial bacteria that devour the excess water nutrients cling to and reproduce on them. They also provide more shade to help protect your pond liner from UV light degradation.